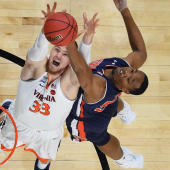 2019 NCAA Tournament: What channel is truTV on AT&T, DIRECTV, Dish Network, XFinity and other cable systems? The 2019 NCAA Tournament is off and running across the country. Fans are closely monitoring their brackets while keeping an eye on how their alma mater is doing over the course of the first weekend. With some many games in the rotation, you need to know how to keep up with all the action across the four major networks. As you know by now CBS, TBS, TNT and truTV are the exclusive carriers for Marc Madness. Since truTV does not carry basketball during the regular season, you might need a little help finding it when the games tip off. They have a ton of games to watch over the next few days. And we are here to help. We've got your complete TV schedule with tip times, channels and announcing teams right here. What channel is truTV on my television? Below is the programming information for each television carrier. You can also go to truTV's website using their channel locator to find more information by clicking here.